Han’s Worst Hits of the 70’s- today is a crossover- released in September 1979- the single peaked at 1 in early 1980. 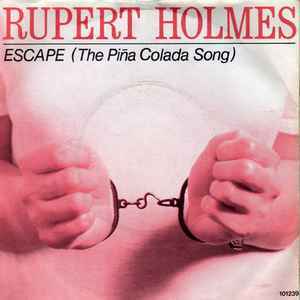 I will call it a 70’s song- the song- the dreadful- “Escape-[The Pina Colada Song}- by Rupert Holmes. There are songs where you have to hear it a few times to hate it- this was hate at first listen for me. Bad lounge music. The song deals with the singer being bored with his relationship- same boring routines etc. He reads a personal ad in the newspaper and spots one that catches his attention. He takes out an ad in reply- and they end up meeting at a bar named O’Malley’s- and it turns out it was his ‘old lady” -they find out they had more in common that they knew. There is no sign of conflict over the fact that both were actively looking for someone else? In late 1979 and early 1980 there was no escaping this song- if you were listening to Top 40 radio. When Holmes who wrote this song started writing it the original lyrics were “If you like Humphrey Bogart and getting lost in the rain”- at the last minute Holmes changed it to the first cocktail that came to mind. This wouldn’t be Rupert Holmes only hit- he followed up Escape with Him #6 and Answering Machine #32 in 1980- all three hits were on his Partner’s In Crime album. Holmes had wanted Him to be the first single off the album but the record label wanted Escape. It’s cheesy and simplistic but better than if he left it as Bogart. There’s a dark flip side to this song that you allude to, the partners are each looking for someone else. I’d like to hear the wife’s song. It’s been 40 years [hard to believe]maybe Rupert will provide us with an update- like Harry Chapin did with Taxi. Lol! In the end it’s sort of ridiculous, although I think the premise is a little sweet and also closer to the truth than any of us would admit: everyone gets into a rut, and we forget how to or lose the desire to discuss how to get out of it. The personal ad just suspended the ambivalence long enough for them to rediscover their commonality. But, of course, it’s probably a band-aid over deep-seated issues and won’t last! Haha. I would bet things didn’t work out and after another year or so they were bored again. Sorry! Its in my head too if that makes you feel any better! Sappy is the word coming to mind for the song. Sap every which way! at this moment he’s probably singing it at a Holiday Inn somewhere. “Hey, it’s the Pina Colada song and it’s my favourite” said no one ever. Some things should never be mentioned, and this is one of them.